Everglades is one of Australia's foremost heritage gardens. 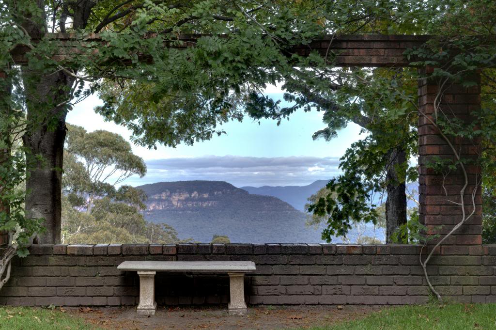 This treasure from the 1930s sits in twelve and a half acres of European-style gardens and native Australian bush with breathtaking views over the Jamison Valley in the World Heritage listed Blue Mountains. Annual Rainfall avg: 1269mm. Summer avg. 402mm. No. of rainy days: 53 Winter avg. 216mm. 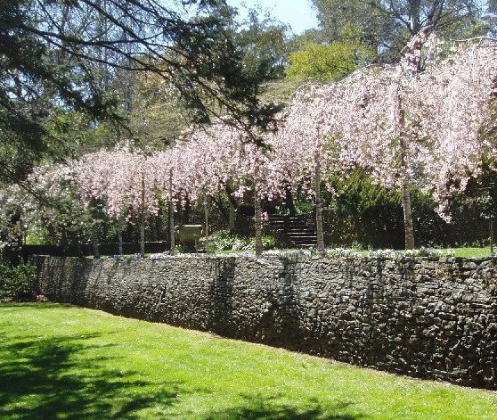 Extending from the courtyard is the Cherry Terrace with its line of weeping Japanese cherry trees. It is defined on the right side by an ironstone wall, softened by a 'floating hedge' of conifers. The effect was achieved by planting the tree roots into weep holes in the wall. A stepped walkway leads down to the Terrace View which traverses the edge of the Jamison Valley. Here the exotic plantings of the upper terraces merge with the natural bushland. Pathways become more informal as they lead down to the Lookout, and its dizzying views to the Gordon Falls below, deliberately concealed until the last minute when it presents the grandeur of the Valley as a surprise. A low, ironstone wall curves along the edge of the Lookout, complemented by wrought iron fencing featuring Art Deco curves, chevrons and the clouds of the Blue Mountains, their patterns reflected in shadows on the ground. Turning back from the Lookout, a path leads towards the Grotto Pool. The grotto is concealed from view until the last minute by a weathered cliff rich in ironstone and foliage. The waterfall which cascades some eight metres down a rockface into the pool below looks entirely natural.